SPARKS – As Beth Rausch joined other music ministers in singing “Welcome Home,” friends and family gathered Oct. 20 at the Monsignor O’Dwyer Retreat House to honor Rausch’s father, Mark Pacione, in a special way. Pacione, a much-loved youth minister and former director of the archdiocesan division of youth and young adult ministry, died suddenly in 2014 following a 40-year career that included helping organize the 1995 visit of St. John Paul II to Baltimore. 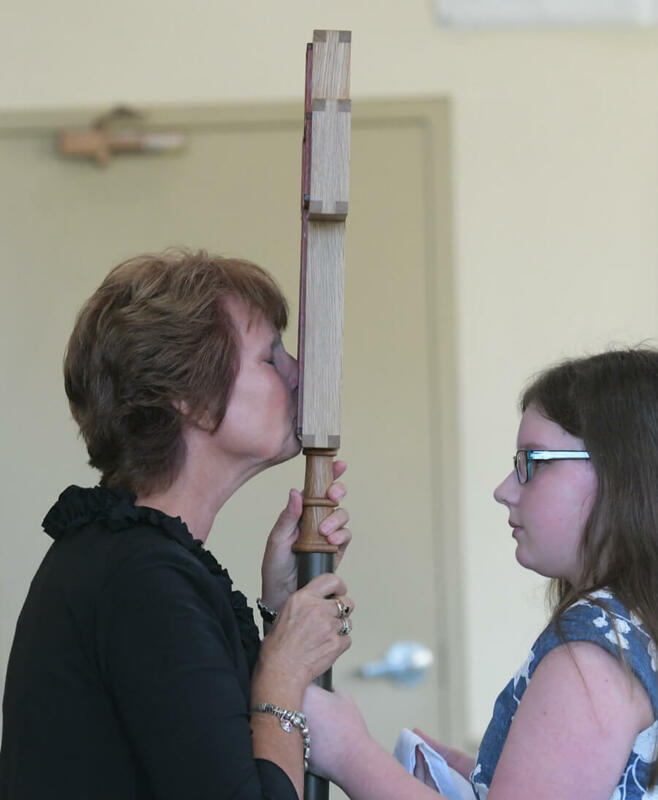 During a Mass, Father Michael Triplett, pastor of Our Lady of Grace in Parkton, blessed a specially designed wood and canvas processional cross crafted in Pacione’s memory. As the fall colors glistened through the windows of the retreat house’s St. Joseph Hall, Carol Pacione, Mark Pacione’s widow, began the veneration of the newly blessed cross. Her genuflection was humble and deliberate. The former pastoral life director of St. Pius X in Rodgers Forge gazed upon the image of the crucified Christ, then venerated the icon. 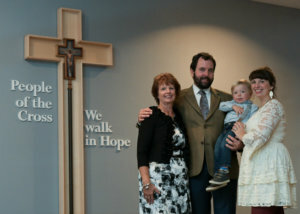 Some 60 guests followed her lead until Rausch, her husband Ian, and their two-year-old son Eliott, completed the moment. Carol Pacione told the Catholic Review that as she approached the cross, she felt overwhelmed two and a half years after her husband’s death because people continue to gather because of him. The processional cross was used officially for the first time as those gathered took a short walk from the hall where Mass was celebrated to the chapel just around the corner. Once there, a wooden cross vessel waited to host its partner. Dimensional letters on the wall next to the cross read, “People of the Cross. We walk in Hope” – the words everyone chanted during the procession. Pacione was the best man at Pat and Lee Ann Sprankle’s wedding, and was godfather to their son Matt. 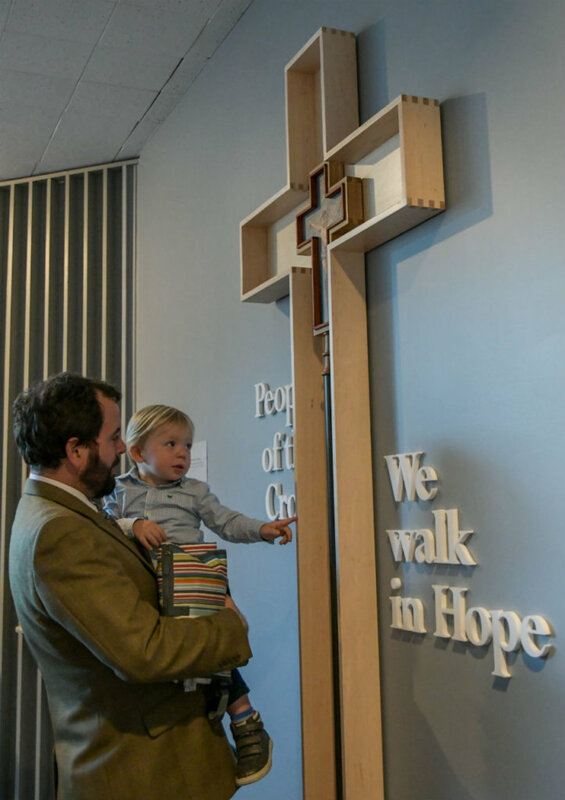 Local artist Stephen St. Amant, who said it took hundreds of hours to make the one-of-kind cross, has known the Pacione family for many years. Michael Downes, who was appointed director of the O’Dwyer campus in 2011, said Pacione was one of the most caring, enthusiastic, faithful people he has ever met. “When you were with Mark, you felt like you were the only person in the world,” he said. The Mark. D Pacione Foundation, which supports archdiocesan youth initiatives, will host a bull and oyster roast fundraiser at St. Mary Magdalen Mission in Bel Air Nov. 4. For more information, visit www.pacionefoundation.com. Kevin J. 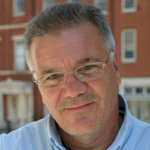 Parks joined the Catholic Review in 2016 as its visual journalist following a lengthy career at Mercy Medical Center, where he shot photography and video for internal communications, marketing and media relations for local and national media. Kevin has been honored by the Maryland Delaware D.C. (MDDC) Press Association, The Catholic Press Association and the Associated Church Press for his work. One of his career highlights is documenting a medical mission in Peru, which received two national awards. A Baltimore native, Kevin is graduate of Archbishop Curley High School and the University of Baltimore. He is a parishioner of St. Francis de Sales, Abingdon.